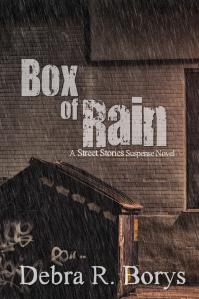 I was nicely surprised this morning to find a tweet from Chicago Book Review linking to a review of Box of Rain. This quick-paced, sometimes dark, but ultimately good-hearted novel aims for light entertainment with a straightforward message, not unlike the spirited Chicago detective novels of Sarah Paretsky. “The characters are lightly but clearly sketched in their precarious situations and there are several nuanced angles to the story. For instance, not all of the people striving to help these young men are thoroughly “good.” Many show traces of both compassion and stubbornness or even ruthless greed. The young men themselves are far from perfect. The police show both concern and callousness. The reporter has more than her share of doubts about the young men; she is not their unfailing champion. Personal problems leave her irritable and sharp-tongued—a possible hindrance in her investigation. All this adds up to poor odds for a young man mired in a major criminal case.